Stock status is current as of 4/18/2019 8:33 AMET. The Joy Factory Unite Stand Mount is perfect for extending the usage of your tablet. This mount works perfect with 7 in. to 10 in. tablets. It is made of carbon fiber which makes it lightweight, durable and strong. 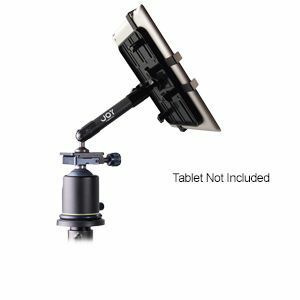 It has spherical joints that ensure easy swivel of the mount arm. It also features magnetic lock technology that ensures the safety of your device from accidental drops. Order the Joy Factory Unite Stand Mount now!